The stunningly inventive new novel from the world's most popular thriller writer. Robert Langdon, Harvard professor of symbology and religious iconology, arrives at the ultramodern Guggenheim Museum Bilbao to attend a major announcement - the unveiling of a discovery that "will change the face of science forever." The evening's host is Edmond Kirsch, a 40-year-old billionaire and futurist whose dazzling high-tech inventions and audacious predictions have made him a renowned global figure. Kirsch, who was one of Langdon's first students at Harvard two decades earlier, is about to reveal an astonishing breakthrough...one that will answer two of the fundamental questions of human existence. Navigating the dark corridors of hidden history and extreme religion, Langdon and Vidal must evade a tormented enemy whose all-knowing power seems to emanate from Spain's Royal Palace itself...and who will stop at nothing to silence Edmond Kirsch. On a trail marked by modern art and enigmatic symbols, Langdon and Vidal uncover clues that ultimately bring them face to face with Kirsch's shocking discovery...and the breathtaking truth that has long eluded us. Origin is Dan Brown's most brilliant and entertaining novel to date. Readers seem to either love or hate Dan Brown's books and I fall heavily into the former category. All of his novels have been fast-paced, action-packed explorations into countries, cultures, and hidden aspects of history that I would probably never get to experience otherwise. He brings the reader along as he explores the world and teaches us fascinating little factoids about the locations or object being discussed, making you feel like you are getting a deeper picture of what is happening within the story. In this way Origin is a typical Dan Brown, going even farther than normal to ask and answer questions that are at the heart of humanity: where do we come from? Where are we going? Origin tackles some of the biggest and most controversial warring aspects of modern life: religion vs. science, classical vs. modern, new vs. old, fact vs. belief. While Brown veers heavily towards the belief in science and technology he also shows an appreciation and love for the classical and the artistic, showing links between the measured science of and the beauty and chaos of nature and life as we know it. I can't tell you too much more about the overall plot of the story without giving something away, but I will say that Brown offers up some compelling answers to the questions he presents, ones that make me both excited for and terrified for humanity's future. My favorite aspect of the story, and one that sort of drives home the point of the ceaseless advancement of technology, is the fact that one of Robert Langdon's companions on this madcap journey is a virtual docent at the museum, one created by Edmond Kirsch himself. "Winston" is a key player in helping Langdon discover what Kirsch was going to reveal to the world and making sure that his revelations are released. While he doesn't physically travel with the human characters he's able to interact with them virtually and search through copious amounts of information to assist in a fraction of the time it would have taken Langdon. To be honest I'm not sure how they would have proceeded without him! That isn't to say that Winston is perfect, but you'll have to read/listen to the story to discover his downfalls. I listened to this story as an audiobook and I think it was the perfect way to experience it. The narrator (Paul Michael) was excellent, keeping the tension tight and the action flowing while also never glossing over those delightful little facts Brown throws in to educate and entertain his readers. Michael also did a wonderful job of changing the accents between characters, given their various countries of origin, something I imagine can't be easy to do. The sound of his voice perfectly matched the Robert Langdon in my head so it was an all around enjoyable experience! 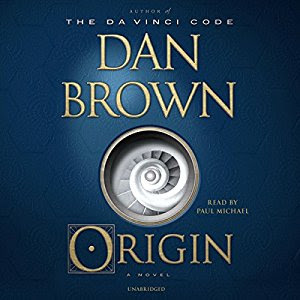 If you already enjoy Dan Brown books you are sure to enjoy Origin as well. If you've never read a book by Brown before this might be a great place to start as you don't have to have read the previous Langdon books to jump into this story. It's a thought-provoking yet quick read that keeps you entertained from cover to cover. It's okay. I like the sort of circling around, closed environment effect of the shell that hints at the cyclical qualities of nature discussed in the story. Other than that it's pretty plain, which is a shame given how vivid and colorful the story is. I borrowed a copy of Origin from my library's Overdrive account. All opinions are mine alone. To find out more about the book, including other reviews and links to where you can purchase a copy, see Goodreads HERE.